Kelly Tapani Jorgenson, born 1974 in nearby L'Anse, and played Junior hockey with the L'Anse Hockey Association. As a high school freshman she played for Jeffers High School in nearby Painesdale, making her the first girl in Michigan to skate on an all boys High School team (excluding goalie). 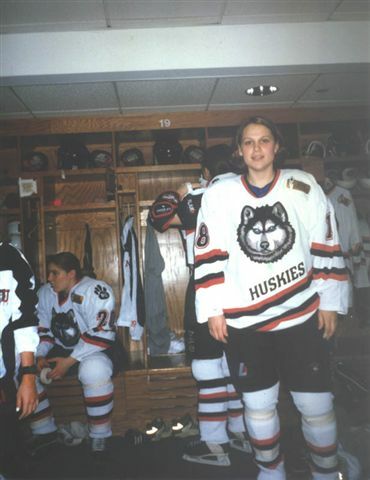 Kelly was the first female Copper Country player to play Division 1 College Hockey: She was a standout at Northeastern University when in 1993 and 1994, they won the Beanpot (Harvard, Boston College, Boston University and Northeastern). When Kelly was a senior at Northeastern, they were ECAC Champions, along with Beanpot Champions. Kelly graduated from Northeastern University in 1997 with a B.S. in Human Service, minor in Psychology and a specialization in Gerontology. A mother of three, she is employed at the Baraga County Family Independence Agency and currently head coach of the Mite team in the Keweenaw Bay Hockey Assoc. leading scorer in the 1994-95 season and Captain 1995-96. 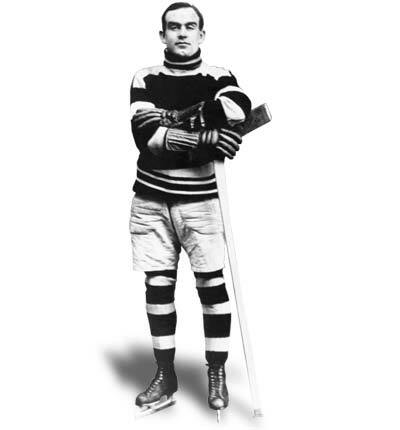 Fred "Cyclone" Taylor Sr. (1884-1979) born in Tara, Ontario, and grew up in Listowel, Ontario, he played rover for 2 seasons for the Portage Lake Pro IHL team 1905-06, 1906-07. 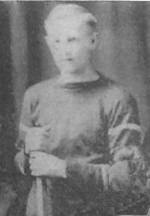 He was drafted by the Portage Lakes midway thru the 1905-06 season, playing 6 games; and the entire 1906-07 season; he scored an amazing 25 goals. While Fred was playing for the Ottawa Senators in 1907, Canada's Governor General, Earl Grey, was so impressed with his incredible speed that when he said "a cyclone if ever I saw one. ", the name stayed with him the rest of his life. 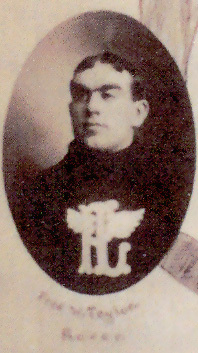 Cyclone Taylor played in 4 Stanley Cup series during his 18 years of professional hockey. 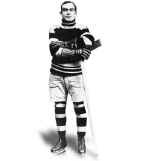 He won the cup in 1909 with Ottawa and in 1915 with the Vancouver Millionaires. He signed on with the Renfrew Kings in 1909, for $5250 for a 12 game season, the richest contract in North American sports history at the time on a per-game basis. The salary at the time, was greater than Canada's Prime Minister, Sir Wilfred Laurier. He was inducted into the Hockey Hall of Fame in 1947. Actually, the Hockey Hall of Fame was the brainchild of Taylor. It was an idea borrowed from baseball's Cooperstown by Cyclone Taylor and Captain James T. Sutherland. They had planned to have a building in Kingston, but from 1943 until a building was secured at the Exhibition Grounds in Toronto in 1961, the Hockey Hall of Fame did not have a building or museum. The Hockey Hall of Fame was at the Canadian National Exhibition Grounds from 1961 until it moved to the former Bank of Montreal building in Toronto in 1993. Doug Tesen, born 19-- in -- from Hancock, played on the Hancock High School team when he team won the 1924 State and Northwest Championship and 1924-25 when they won the State Championship again. 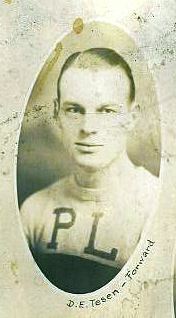 He played for Portage Lake in 1925. 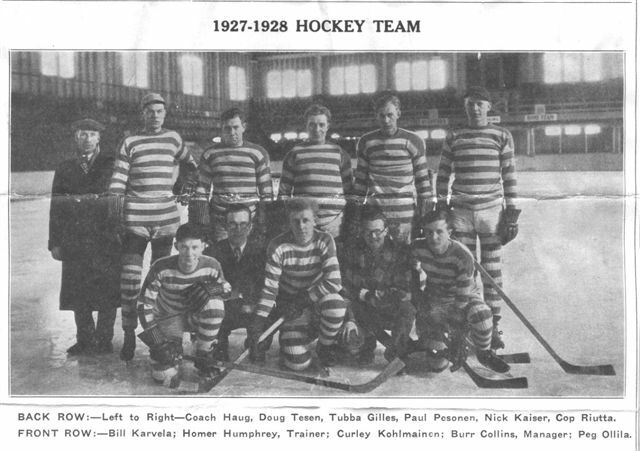 He was on the 1930-31 Hancock Eagles when they won the State Amateur Championship and the MacNaughton Cup. In March 1924, he was chosen as the All Star Right Wing after a tournament of local HS teams. He went on to play hockey for Michigan Tech 1927-28 and for Portage Lake the same season when the won the UP Championships. Back Row L-Rt: Coach Haug, Doug Tesen, Tubba Gilles, Paul Pesonen -capt, Nick Kaiser, "Cop" Emil Riutta. Front Row L-Rt: Bill Karvela, Homer Humphrey -Trainer, "Curley" Ray Kolehmainen, Burr Collins -Mgr, Peg Ollila. Slip on MCM jersey vests missing. Picture in the New Amphidrome rebuilt in 1927. 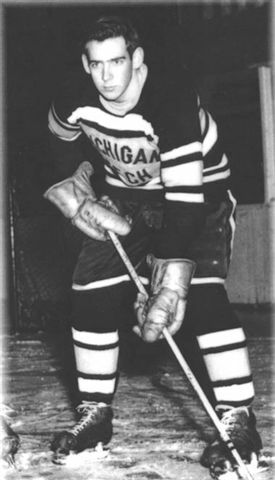 Paul Tormala, born 1933 in -- from nearby Portage Entry, Chassell, played hockey for Michigan Tech 1951-54 and after serving in the Naval Reserve for 4 years, he continued to play or coach hockey ever since. In 1959, he and several others started the Livonia Hockey program using an outdoor rink. From 1961-68, he coached the Lansing Juvenile Team; they won the Michigan State Outdoor Championship in 1966. From 1969-74, he played with a group of seniors at Demonstration Hall at Michigan State University and officiated some in the Lansing Senior League. From 1974-83, he coached the first Okemos High School team; in 1975 they won the Lansing Area High School Championship; they won again in 1982. From 1982-89, he was the Head coach or assistant coach with son, Andrew's, teams in Lansing, Grand Rapids, and Royal Oak; the Royal Oak Royal team won the State Junior B Championship in 1989. From 1990 to the present, he has participated in many of the MTU Alumni hockey games and played in open hockey sessions at a number of rinks in the Detroit and Port Huron areas. Edwin W. Tulppo, (1905-94) was born in nearby Wolverine, now called Kearsarge. "Scotty" as he was nicknamed, played on the first Calumet High School hockey team in 1919-20. He played baseball for the Wolverine team, and played halfback on the Calumet HS football team when George Gipp came to their practice to show them how to handle the ball. He played hockey for Michigan Tech 1927-1931 and graduated in 1931 with a BS in Metallurgical Engineering. While at Tech, he was enrolled in the Army ROTC program. Ed was the coach of the 1933-34 Wolverine Athletic Club UP championship hockey team that won the Hawk trophy and the MacNaughton Cup. He was an officer in the CCC Corp and just prior to WWII, he was commissioned a 2nd LT in the U. S. Army Air Corps. He retired in the 1960's as a LTCOL in the USAF Reserve. Ed on the 1919 Calumet HS team.